How is the Average Inventory calculated for the Inventory Turnover Report for MAS90/200? How do you resolve MAS90 or MAS200 Force close errors when you are running MAS on a Terminal Server on a WIN 2008 R2 64 Bit server? The following DSD White Paper explains the 2011 changes to filing of California EDD Quarterly Unemployment, and how it relates to DSD’s MRCA California Quarterly Unemployment Reporting. What are DE6, DE9 and DE9C filings? How does DSD’s MRCA California Quarterly Unemployment Reporting fulfill these filings in MAS90 | MAS 200? What format is the MRCA California Quarterly Unemployment Reporting in? How do I setup an online account with the EDD? How do I generate the upload file using DSD’s MRCA California Quarterly Unemployment Reporting? How do I upload the file to the EDD website? How do I contact the EDD for assistance? When filling out this form, you submit Company and Employee information on one form. If you have 250 employees or more, you may not use this form, but must instead file electronically. DE9 and DE9C: Starting in 2011, the DE9 and DE9C forms replace the DE6 form. Basically, they broke up the DE6 form into 2 forms: The DE9 is the Company information, and the DE9C is the Employee information. As with the DE6 form: If you have 250 employees or more, you may not use this form, but must instead file electronically. How does DSD’s MRCA California Quarterly Unemployment Reporting fulfill these filings when using MAS 90 |MAS 200? As mentioned, if you have more than 250 employees, you may not use the DE6 or DE9/DE9C forms for filing. Conversely, you may file electronically instead of using these forms, regardless of how many employees you have. DSD’s MRCA California Quarterly Unemployment Reporting is a MAS 90/200 enhancement that generates the file that can be sent to the EDD electronically. It can be purchased through your Sage Reseller. If you are a Sage Reseller, you may contact DSD directly to purchase at (858) 550-5900. DSD’s MRCA California Quarterly Unemployment Reporting is in the ICESA format. According to the California EDD, all 4 formats will be allowed for the next few years. At some point, the MMREF and ICESA formats will be retired, and you will be required to submit in XML format. DSD is currently researching this format, and the MRCA California Quarterly Unemployment Reporting will be changed to this format in the next 18 months, before it is required by the EDD. 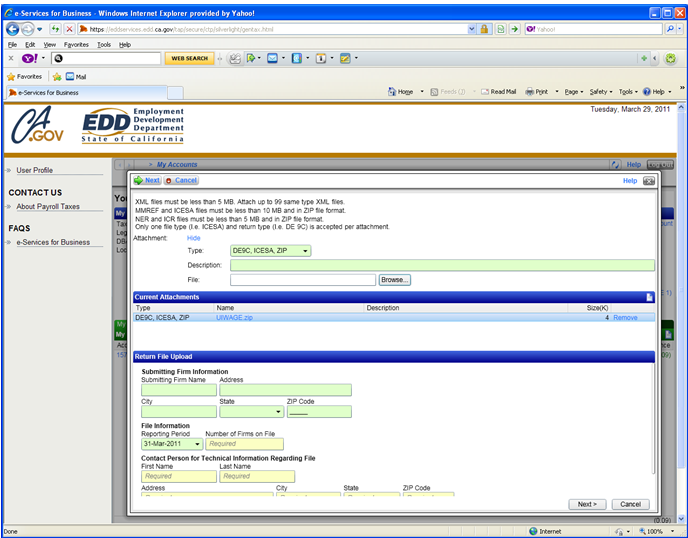 When uploading the electronic file, the EDD allows for the CSV and XML files to be uploaded as-is. For the ICESA and MMREF formats, the file must be zipped into a .zip file before uploading. 3. Enter the information on the e-Services for Business enrollment. 4. Continue through the enrollment process. Once you obtain a User Name and Password, you will then have the ability to upload your electronic file. Please review this User Manual, as it explains how the UIWAGE file is created. Once you create your UIWAGE file, you can then zip the UIWAGE into a .zip file, and use the .zip file to upload. To create a .zip file, typically, you can right-click on the UIWAGE file, and select “Send to” and then “Compressed (Zipped) Folder”. This will create a UIWAGE.ZIP in the same directory as UIWAGE. Again, the UIWAGE.ZIP is the file that you upload. 3. After you login, a new screen will be displayed that has two sections. On the top section, it displays My Summary and on the bottom section, it displays My Accounts. 5. IMPORTANT: Do NOT select an account from My Accounts, as it will display different ”I Want To” selections. 7. A new screen will be displayed that allows for you to enter information for the upload. 8. At the top of this screen, it will ask you for the Attachment Type. 10. Select the Browse Button to select the UIWAGE.ZIP that you generated from DSD’s MRCA enhancement. 11. Go to the Return File Upload section and complete the information on the screen. On the following page, Appendix A, there is a screenshot of this Upload screen. There are many phone numbers on the EDD website that you can call, but the one that I used that got me directly to the proper person is: (800) 796-3524. Jim Woodhead is Vice President of Professional Services of DSD Business Systems, a national provider of on-demand (cloud) and on-premises ERP and CRM software, specializing in wholesale distribution, manufacturing, warehouse management, inventory, business intelligence and eCommerce software. DSD offers Sage 100 (formerly MAS 90), Sage 300 (formerly Accpac), Sage 500 (formerly MAS 500), NetSuite, Sage FAS, Sage HRMS (formerly Abra), Sage CRM, Sage SalesLogix, Extended Solutions, and Custom Programming. How do you resolve MAS90 or MAS200 Force close errors when you are running MAS on a Terminal Server on a WIN 2008 R2 64 Bit server? How is the Average Inventory calculated for the Inventory Turnover Report for MAS90/200? Are you missing the images/icons on the MAS90 or MAS200 Taskbar Launcher? Biznet’s take on BIZNET vs SAGE MAS Intelligence.